Are You Making Any of These Costly IT Mistakes? The cost of a data breach has grown to $4 million on average. Paying an in-house IT professional can cost your business over $130,000 per year. If you haven't thought about how IT impacts your company's bottom line, it's time to face the facts. 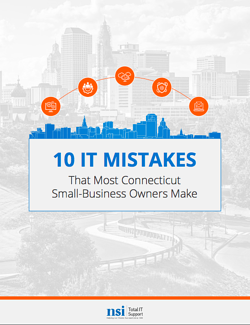 We created this guide to help you avoid the most common IT mistakes Connecticut small businesses make so that you can focus on what you do best—growing your company. Fill out the form for a direct download to your email!